Vanilla flowers are fragrant, waxy and large. If flowers remain un-pollinated, they last only a day. The fruit is a capsule, but in the trade of vanilla it is referred to as a bean or pod?. It reaches 10-25cm in length and about 1.5cm in diameter at harvest size. After the beans are harvested and cured they develop their aromatic fragrance. Hand pollination is necessary. Individual flowers are pollinated in the early morning, directly after opening. A small stick about the size of a toothpick is used. The rostellum is pushed aside and pollen is spread from stamen to stigma. Vanilla flowers once a year in spring over a period of about two months. If fertilization has been successful, the flowers remain on the rachis for two or three days. In the wild as a native plant, vanilla grows by climbing on trees in wet tropical jungles from sea level to about 600m, so thrives in a humid, hot climate with consistent rainfall, with two months of dry weather for flowering. The best average temperature for vanilla production is 28 C, but it will tolerate a range between 21-30 C.
PLEASE NOTE: orders limited to 5 per customer thanks. Part shade to deep shade. Will not tolerate frosts. Well drained soil, with a deep layer of humus is ideal for vanilla growing and it is usually grown on shrubs or small trees (chose species which do not lose their bark). 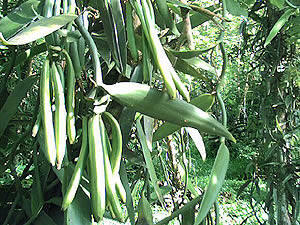 Vanilla pods are harvested before fully ripe; then fermented and cured. To encourage fruiting trail the vine back downwards and along a horizontal branch or fence - the change of growth direction from upwards to down and across helps produce more flowers. The vanilla plant starts producing fruit only when it reaches around 2m.